When Wayne County Circuit Judge Prentis Edwards ordered billionaire Matty Moroun to jail on last January for failure to comply with a year-old court order, residents of Southwest Detroit were delighted. Moroun owns the Ambassador Bridge, the busiest international bridge in North America. A trucking magnate, he bought the bridge in 1979 primarily to provide his customers with favorable rates between Detroit and Toronto. His shipping empire reaches as far as Shanghai and Saudi Arabia, but it is rooted in Detroit, where he also owns the iconic and dilapidated train station and several hundred parcels of property. His family has tentacles in many businesses, including a company works inside General Motors’ Lake Orion plant, where their unionized workers are paid nine dollars an hour. Southwest Detroit is one of the few areas of Detroit where the population has grown over the last decade. About 13,000 trucks drive through the neighborhood each day. In 2008 the Michigan Department of Transportation (MDOT), in conjunction with Detroit International Bridge Company (DIBC) management, launched a $230 million project to build new entrance and exit ramps, cutting down on the amount of truck traffic on residential streets. After a massive repaving of highways leading to the bridge, MDOT filed a lawsuit three years ago saying DIBC failed to complete its portion. Part of the MDOT lawsuit noted that bridge management build gas pumps and a portion of a duty-free store on city property. This seems to be a Moroun trademark—last year area residents tore down a fence that had been illegally constructed to take over a city park that sits beneath the bridge. Having the road to the toll area pass by the pumps and store backs up traffic, forcing trucks to wait along on the roads and highways, spewing a toxic mixture of gases and particles. This diesel pollution includes particulate matter that by passes the body’s natural defenses and penetrates deep into the lungs. Seventy percent of the cancer risk from the air we breathe is attributable to diesel PM. Nitrogen oxide from diesel engines also contributes to asthma, particularly among children and the elderly. Southwest Detroit residents, and particularly children, suffer disproportionately from these problems. DIBC also illegally constructed Pier 19, which has been dubbed “the bridge to nowhere.” It is the foundation for a second span, but actually sits in the path of a planned truck access road. Two years ago Judge Edwards ruled in favor of the MDOT lawsuit and ordered Moroun to demolish the construction on city property and to complete the work on the ramps by January 10, 2012. Last year the judge found the company in contempt of the court order and briefly jailed DIBC President Dan Stamper. At the January 2012 hearing Judge Edwards ordered the company to pay a $7,500 fine as well as the MDOT court and attorney fees and ordered both Stamper and Moroun to jail until the company complied with his order. Attorneys for Moroun and Stamper immediately produced papers showing that they had resigned their positions and were no longer in positions of authority, but happily the judge dismissed their arguments and sent them off to the city jail–although DIBC lawyers were able to secure their release in little more than a day. Moroun and his son, the vice president of the bridge company, have opposed the proposal to build a publicly owned second span to Canada. They have spent millions on lobbying the Michigan legislature, on backing candidates pledged to vote against the proposal as well as on TV ads. Instead Moroun seeks to build his own second bridge. Following the January ruling, DIBC produced TV and print ads claiming that the judge’s decision was based returning a political favor to Governor Snyder. The ads also put the blame on MDOT, but within a month the company reversed its position and claimed work would resume–perhaps in preparation for its next appearance before Judge Edwards on March 8. Edwards shocked the packed courtroom when, after stating that the company had not demonstrated it was complying or intending to comply with the court’s order, he had them relinquish its tie to the project and turn over control to MDOT. DIBC’s only further responsibility is to fund the cost of completion. After the hearing DIBC President Stamper wisely declined to comment. 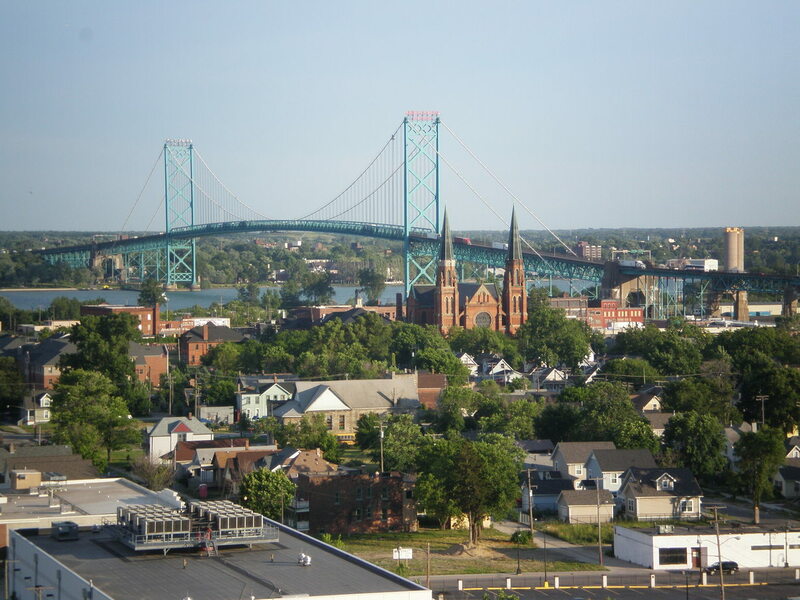 The Ambassador Bridge is now 82 years old and is under constant repair. The same day that Moroun and Stamper were jailed, Kent Morton, a 27-year old painter fell more than 100 feet into the river and disappeared after scaffolding collapsed. Seaway Painting, the subcontractor that employed the painter, has been fined 30 times since 2008 by the Michigan Occupational Safety and Health Administration. As the Detroit police dive team is still searching for Morton, it is unknown whether he was wearing the mandatory safety equipment that should have prevented his fall.